I recently started another website for the purpose of uploading all my “Low Carb” recipes. The link below will take you to the site should you be interested in uploading my free e-book, or just taking a peek at what I have to offer. One of the latest recipe I posted is a doughnut recipe. I have to say that even people who are not into low carb eating seem to enjoy them immensely. I will be removing the current page on this site, as I want this to be dedicated to knitting. This is my latest knitting endeavor. 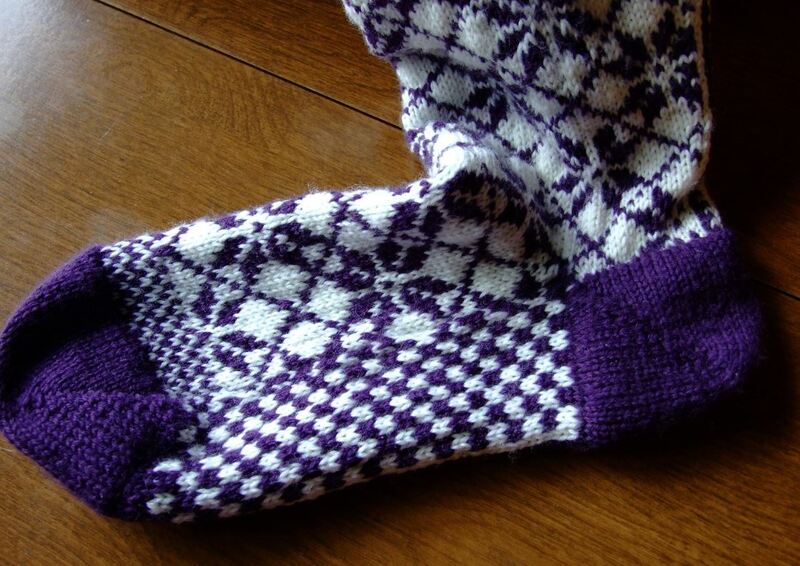 This sock is knitted in Fair Isle, with a double heel and toe. Below is the inside of the sock. 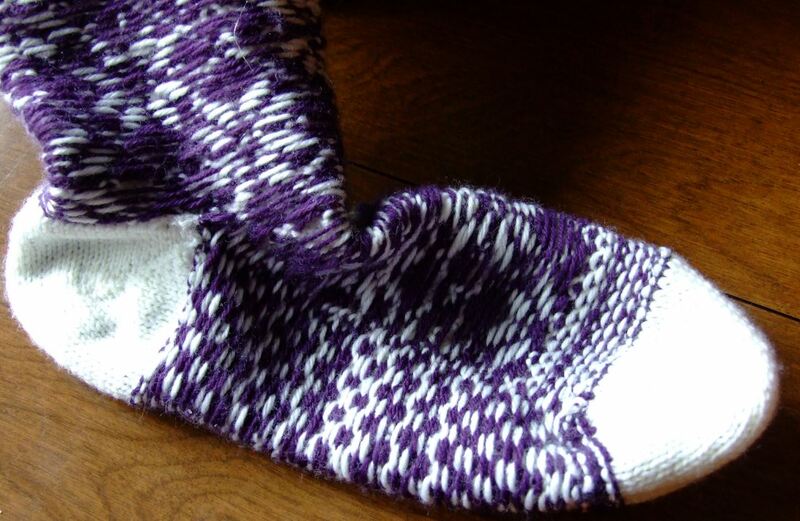 You can see that the toe and heel are smooth, as the knitted side is on the face. I accomplished this by first setting up the heel section for double knitting ( knitting and purling in the same stitch with the appropriate colors). The next step was to put the white(or inside stitches) on a #0 circle needle, letting them ride on the cord while I knitted the short row heel in purple. Once the outside heel was done, I simply slipped the “white” stitches on to my #3, and completed a duplicate heel. Next, I matched up the short row turns, connecting them together with one ply of the yarn. I did this to keep the two heels in proper alignment. ** One trick I learned with this experiment was to set up for the double knitting with a size smaller needle. If you don’t, then you need to take the slack out of the stitches before you start knitting the heel/toe, working from the right to left toward the working yarn end. The next step was to join knit last row of the heels together. From here I continued the pattern of the instep and heel. At the toe portion, I repeated the heel procedure, joined the two toes together as before, then Kitchener stitched the final stitches to the remaining stitching of the sole. The basic sock is knitted form the top down, and is tapered in to fit my leg. I had the star pattern from another sock. 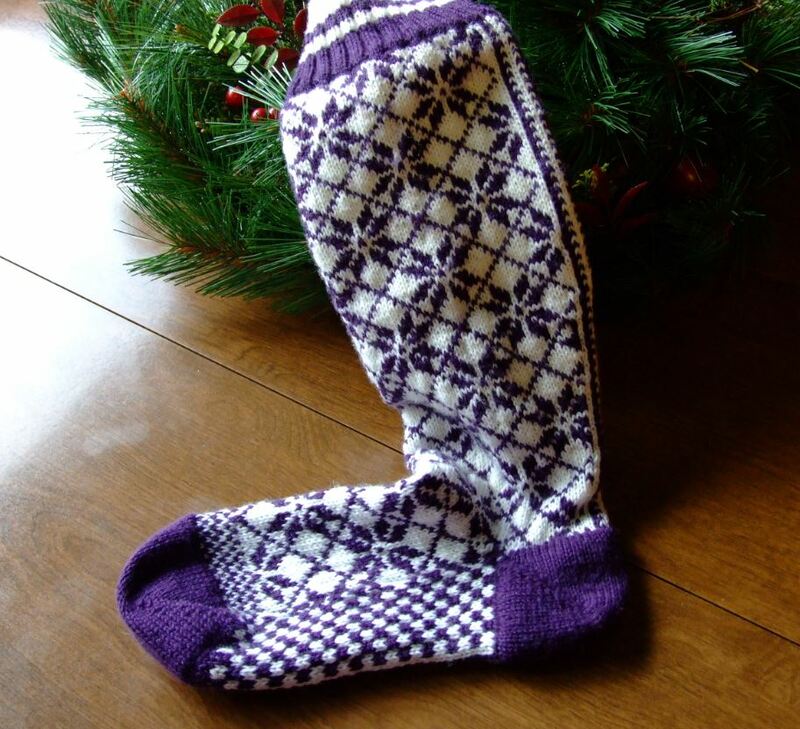 You could use any of your favorite designs for this sock. I will be working on a demo for the heel and toe, and will upload it when it is finished.